We have a lot to celebrate in Vermont right now. The Vermont State Hospital no longer exists. If we play our cards right, this could be a great opportunity to avoid the mistakes of the past. I want to share with you an incredible story of hope—hope that people who have mental health challenges will be able to move on with their lives, doing the things they want to do, being the kind of people they want to be, and living the life they want to live; a story that should inspire our future and protect us from making the mistakes of the past. This story begins a long time ago. It began when someone, or “someones”; people in charge, probably dressed in whatever the business suits of the day looked like, decided that if people were acting in an unusual way – upset, anxious, loud, boisterous, claiming to be someone they were not, hearing voices—the list of signs goes on and on—that even though these were people that had had horrific things happen to them—they decided that these people should be treated – or was it punished – by incarcerating them in huge institutions for long periods of time, often for the rest of their lives, where they were treated harshly and subjected to bizarre treatments. Once they were in these institutions, most of these people stayed there for the rest of their lives. That went on for years and years and years. People with severe mental heath challenges lived out their lives in massive institutions—known as state hospitals. In 1966 there were 1,172 people living out their lives at the Vermont State Hospital. Imagine. There were even more, many more, people paid for by the state to live out their lives at the Brattleboro Retreat. There were institutions like this all over the country. In these places the men were separated from women. Multitudes of people were crammed onto porches, porches stacked on top of porches, with bars to the roof, screaming, crying, calling out. People were wearing, not their own clothes, but hand-me-downs donated by the benevolent women of the church. You didn’t own anything; you didn’t have anything personal, not even a picture. Nothing to do, nowhere to go, day after day after interminable day in that awful bleak place. People slept in big wards with lots and lots of other people with only a small bureau for your meager “belongings” in between the beds. Before we move along in our story, we must commit ourselves to never forgetting the people who lived out their lives in these buildings; at Connecticut Valley Hospital where my mother was a patient for too many years, at the Vermont State Hospital, at the Brattleboro Retreat. We must never forget the people who are buried in those hospital cemeteries, in unmarked graves all over our country. People who had committed no crime, people who just wanted their lives back, people who had given up hope that that would ever happen. And to honor them, we must do everything in our power to make sure this never, never happens again. Back to the story. Remember there are 1,172 people at the Vermont State Hospital. Let me introduce you to Rupert Chittrick. Rupert… I don’t think he would mind being on a first name basis with me… was the superintendent at the Vermont State Hospital in 1944. He looked around and said, “Hmm, something is not right here. How can people get well in a place like this?” So he began to make some changes– minor at first– but he set the stage for what was to come. He began laying the foundation for a therapeutic community in the hospital. At about the same time, Francis S. Irons became the director of the Vermont Vocational Rehabilitation Division and began expanding this division’s program in a way that permitted the work that was to come later. Then in 1947, along came an M.D., Dr. George Brooks. George was highly regarded as a strong advocate for improving mental health care and for people who experienced mental health difficulties. In 1957, he applied for a grant that was funded through the U.S. Department of Health, Education, and Welfare, Office of Vocational Rehabilitation. It was called the Vermont Project. Its purpose was to develop and implement a rehabilitation program for people diagnosed as having “chronic schizophrenia”. As you know, you can fit almost any symptom into that category. Many of us have had that diagnosis at one time or other. I will refrain from asking everyone who has had that diagnosis to raise their hand. The Vermont Project changed the lives of hundreds of people who had lived at the Vermont State Hospital for many years—some for over 30 years— and it became a guide for similar efforts that were occurring or being planned across the nation. Brooks, and the people that were working with him, recognized that in cases of lengthy hospitalizations, the person would no longer have a place in a community. They might have lost many of their employment and social skills. They might no longer have contact with friends and family. They decided that in order for the person to be independent, self-sufficient, and reinstated into the community, there must be active participation by both the person and the community in the rehabilitation program. · A more normal, home-like, relaxed atmosphere with pleasantly decorated and furnished wards, where people had pets, made popcorn and had parties. · Groups that focused on reality problem-solving in the areas of job training, job finding, living arrangements, social activities, and the relevance of hospital activities to the patients’ goals in these areas. People were encouraged to make choices —something they hadn’t done for a very long time. · People were involved in occupational and recreational therapy groups designed to encourage or require group cooperation, first with each other, then toward the entire hospital, and then toward the community. They made dinner for each other, put on a hospital bazaar, and participated in the village Fourth of July parade. · The hospital was used as a training facility where people were assigned to jobs based on their expressed interest and ability –a new concept for these people and in light of their future plans. They worked toward paid employment in the community. · People received intensified vocational counseling on planning for the future, which continued even in the rehabilitation house or in the community until the person was well established. · Leaving the hospital was considered a critical life transition. People were given instruction, and rehearsed situations they were likely to encounter in the community. They lived in halfway houses or participated in a form of graduated return to the community. Supports and long-term follow-up contacts were established to continue after the person was settled in the community. By 1965, more than 500 people had been successfully returned to the community. This program was the beginning of a statewide system of community mental health centers designed to take over aftercare programs and to provide a wide range of outpatient, prevention, and support services. Over time the census at the hospital went down and down and down until it sort of settled in at 40-60 people at any given time up until Hurricane Irene. 30 years later, two different researchers said, “Hey, I wonder what happened to all of those people in the Vermont Project. They must be back in the hospital by now—or living on the streets.” But no, they found that they were out living their lives, doing the things they wanted to do and being the kind of people they wanted to be. They had families and friends and homes and jobs. What a surprise! These landmark studies were hailed across the country and around the world as evidence that, given intensive education and support initiatives along with medical treatment, recovery from mental health challenges is possible. This finding had a great impact on the mental health field because it was in opposition to the longstanding view that people with mental health issues could not get better, and could even expect to get worse as they aged. This research convinced people across the country and around the world that recovery from mental health difficulties is possible and even probable. This is a fantastic, incredible, and true story. You can read about it in the Vermont Story and in Empty Beds. Let’s have a standing ovation for all of the people that participated in this project that gave so many people back their lives: Roger Chittrick, Donald M. Eldred; George W. Brooks; William N. Deane; Marjorie B. Taylor, Francis Irons and the many, many others whose names have disappeared into history. Unfortunately, the Vermont State Hospital gradually reverted to its old ways. It lost its place of honor as an avant-garde institution. Through the late 1980s and 1990s and on into the new century, funding was reduced and attention was focused on community mental health centers. With changes in key personnel and government officials, the phenomenal “Vermont Story” was forgotten and while some programs persisted in the community at the mental health centers, many of the programs that meant life to so many people were forgotten as well. For a number of years now the state has been trying to figure out what to do with the state hospital—what to do with the whole mental health system in Vermont. There have been lots of meetings, lots of ideas, and lots of false starts. No one could agree. And of course—no one wanted to spend the money. What would it take to get things back on track? You got it. An act of God. A great flood that would send the state hospital floating down the river. Hurricane Irene. Who could have ever predicted it? Along came Hurricane Irene. We think we have all the power but we really don’t. So the state hospital is effectively gone. But the state hospital is not the whole story. Something will be contrived to replace it. More about that later. As things have been going along at the hospital with 40-60 patients (it never again became the huge human warehouse that it had been), there have been mental health recovery advocates who have been working tirelessly to promote mental health recovery in Vermont. We started meeting 16 or 17 years ago. Lots of us. People who had been dealing with mental health issues for years and were invested in mental health recovery. Without knowing we would ever be in this position, with the Vermont State Hospital going down the river, this group has done a remarkable job of setting the stage for what could be the greatest mental health system in the country. This group paved the way for what was to come in the ensuing years, and for what, I believe will be the future of Vermont. This group, assisted and supported by people like Beth Tansman, Rod Copeland, Nick Nichols and others in the State Department of Mental Health, got a grant from the Van Ameringen Foundation to support a series of workshops based on my work—my work of trying to find out what helps people who are having mental health challenges recover and move on with their lives. Mental Health Recovery and later WRAP were the first Transformation Project. Now we have the Transformation Grant to fund the next one. Almost 15 years ago now, one of the groups funded by this first grant, a small group of dedicated individuals who came from all corners of Vermont–not people with advanced degrees to teach us what we should do, but people who were, even at that time, experiencing the worst of mental health challenges, people who were hearing voices, people who were so anxious it was hard to sit still for even a few minutes, people who were experiencing paranoia and delusions, people who had spent months and years in psychiatric hospitals, people who intimately knew the depths of despair, people who had been told they would never get well, that they would probably get worse as they aged. These people came together in northern Vermont in the brutal winter of 1997 to learn various skills and strategies that they hoped might help them to recover and move on with their lives—RECOVER— a word not commonly used in those days for people with mental health issues. So this group, in the cold of winter, came back to Bradford, VT, many of them over slippery country roads, even when it was storming—to spend several extra days together. On the first of these days, I was riding with Jane Winterling. She was driving her old Volvo. We had a 1½ hour trip on one of the two major highways in Vermont. Two other participants were traveling with us. On this particular day the highway was almost deserted. A cold wind was blowing and icy snowflakes were falling from the sky. Jane was talking about the need for a step-by-step process to address this issue, with various parts for things like Triggers and Early Warning Signs. About that time a big, empty flat bed trailer truck went barreling by us and its trailer, caught by the wind and the ice, swung around so close to the front of the car, that we all gasped in horror. WRAP almost ended right there before it began. But we made it. The group quickly picked up on Jane’s suggestion and worked hard, checking out various options and having lengthy discussions, to develop what has now become known across the world as the Wellness Recovery Action Plan or WRAP. Yes, WRAP, which has now spread around the country and around the world, was developed right here in Vermont. And here in Vermont, we need to use WRAP and the values and ethics that have evolved with WRAP to be used as our guide as we move forward to develop programs to replace the Vermont State Hospital. Even while the state hospital continued to exist, others were following a different path. In the last 15 years, Vermont has trained many, many WRAP facilitators, and people all over Vermont have learned about WRAP and are using it as their daily guide to wellness and recovery. For many of people, this meant that when they were not feeling well, they could do things to help themselves feel better, and no longer need to use intensive services. In fact, so many people in Vermont are now familiar with WRAP and doing WRAP that we can’t study it quantitatively here because we can’t find people who don’t know about WRAP for a control group. 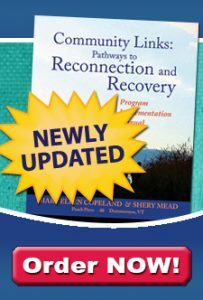 Vermont has trained numerous WRAP and mental health recovery facilitators. These people have become statewide and even national leaders in the recovery movement. People like Linda Corey, Jane Winterling, Marty Roberts,Steve Morgan, David Morgan, Kathy Perry, Jean New, and George Norstrand. Jesse Parker is no longer going from hospital to hospital across the country. She is working for the mental health system, supporting people as they work on their recovery. Jane Winterling and Linda Corey got WRAP training going at the VA Hospital in White River. David Morgan wrote a WRAP for himself, stayed out of the hospital for two years and became one of the founders of Vet to Vet, which provides veterans with needed support. He teaches people how to develop their own WRAP and how to facilitate WRAP groups. George Nostrand started reading the Depression Workbook on a hospital ward, learning about and incorporating WRAP into his work plan, going on to become one of those wonderful people, a Vocational Counselor, and using WRAP as a tool with the people he helps. He does workshops and keynotes about work and recovery all over the country. We have infiltrated and impacted every part of our system and the way services are delivered through the system. WRAP gave us hope so we could stick with it and become the solution rather than the problem. We cannot rest on our laurels. The work is not finished. Likely it will never be finished. This is not yet the end of the story. As you know, as WRAP evolved, a set of clear values and ethics grew up around it. As these values and ethics began to emerge, we all shared them with lots and lots of people. Some people added to the list. Some people asked that particular points be amended in a way that made sense. Over time, more and more people seemed satisfied with the list. And I am convinced, that if we use these Values and Ethics as our guide, always keeping in mind the incredible work that was done in Vermont so many years ago, we can once again set up in Vermont a mental health system that will be so outstanding that people everywhere will want to replicate it. All of us, using our collective energy, the same energy that we have used and continue to use to spread WRAP and mental health recovery, can, will and must keep the values and ethics strong and vital, keep the pendulum from swinging back to that time, so very long ago, when those “someones” decided to put us away, when recovery was not a word that was connected with mental health issues. We must work to make sure that every person knows that they can get through even the hardest of times, and come out on the other side, and that the system can provide the tools so that can happen. We must work to make sure that every person has access to this knowledge and to these services without stigma—young and old, rich and poor. When I was out for a walk the other day, I met a neighbor. She told me that she works at the Retreat and that they use my work. She says we have all these new patients from the state hospital and we don’t know what to do with them. I wanted to shout at her “What about WRAP?” I wanted to give her a lesson right there. We must work to make sure that every person who reaches out for help with mental health challenges is assisted and supported as they determine their own path, to take personal responsibility for their own recovery as they become empowered and as they learn to advocate for themselves. That they will then be given the opportunity to discover their own personal wellness tools and develop their own Wellness Recovery Action Plan. We must work to make sure that every person who reaches out for help with mental health challenges, whoever they might reach out to, is assured that there is hope, that lots and lots of people get well, stay well for long periods of time, and do the things they want to do with their lives. We must work to make sure that every person who reaches out for assistance with mental health issues is treated with dignity, compassion, mutual respect, and unconditional high regard, and to be treated as a unique and special human being who is fully accepted without prejudice due to diversity, ethnicity, language, religion, race, gender, age, disability, sexual identity, or “readiness” issues, and that they will treat others the same way that they expect to, and deserve to be treated. We must work to make sure that every person understands that there are “no limits” to recovery. We must work to make sure that all mental health treatment and participation in all mental health programs, including the use of WRAP, is totally voluntary, that the person who is developing their WRAP decides if they want to do it, when they want to do it, how long they will take, what it will include, and who will assist and support them as they work on it and live it. We must work to make sure that everyone understands that the person who is reaching out for help or is developing their WRAP, is the primary expert on him or her self. We must work to make sure that in all of mental health care and treatment, the focus will be on strengths and away from perceived deficits; the focus will be on things you do well, and negative judgments and deficit-based assessments will be avoided. We must work to make sure that clinical, medical and diagnostic language has been discarded, and is considered obsolete and without value. We must work to make sure that people who have mental health challenges work together and learn together to increase mutual understanding, knowledge and promote wellness, and that peer support is the rule rather than the exception. We must work to make sure that only personal wellness tools and other strategies that are simple and safe are used for treatment. Things like a broken cell phone. Ron Coleman in Great Britain tells the story of a man who had trouble going out in public because, when he did, his intrusive and horrific voices would start yelling at him and he would yell back. Then someone would report him and he would get taken away to spend a few days at the local mental health facility. So he tried taking a broken cell phone with him. When the voices started up, he yelled back at them into the cell phone. And then nobody paid any attention. We must work to make sure that difficult feelings and behaviors are understood as normal responses to traumatic circumstances and to difficult things that are happening in our lives, and that all treatment is trauma informed. We have come so far in this regard in the last 20 years. 20 years ago, all mental health problems were considered brain disorders. Now it is clearly understood that in many, many cases, mental health issues are a response to traumatic life experiences like abuse, poverty, neglect, war, disability and disaster. We must work to make sure that restraints, seclusion, the use of body bags, tasers and other traumatic procedures are never again used in Vermont. We must work to make sure that families like mine, and yours, will never again know the horror of losing a family member to long term illness, institutionalization or suicide. We must work to make sure that people in crisis have a place to go and be supported for as long as they need that support—a place where there is food if they want it, where they can be alone or with others, where they can be inside or outside, where there are things to do if they want to do something—whatever it is they need to do. We must work to make sure that treatment meets the needs of individuals and not the pharmaceutical industry. We must work so we may see the day when every person has a comfortable living space, food and easy access to health care. Using the values and ethics that I have just shared (you can find them on my website) as a guide, you, every one of you, can do the work to assure that this story has the right ending. There is one last thing we can and must do to make sure this story can end with “and we all lived happily every after”—one last but enormously important issue we must address. Today, as we sit here, the next generation of people with extreme mental health challenges is being cultivated. Children and young people are being physically, emotionally and sexually abused. Children are homeless, hungry, cold and neglected. Children have been the victims in the many natural disasters that have plagued this country over the last years, and by a political system based on greed, with riches for the few who have done nothing to deserve them, and devastation for everyone else. It is now widely accepted, as it was not when I began doing this work, that with this kind of trauma, if the circumstances are not addressed and rectified, if there is no help, no counseling, no support; that if the circumstances do not change dramatically, that these children and young people will become the next generation’s mental patients, the inmates in our jail and prisons, or end up living lives of desperation in our communities. The work that needs to be done to keep Vermont on the right track, and to prevent this great impending tragedy, cannot be done by one or two people. And it can’t be done by Vermont Psychiatric Survivors alone. Each of us, every one of us must play a role. We must confront our state legislators, our governor, all of the candidates that run for office, all of the government officials. We must make children and youth a huge political issue. We must make it such a huge political issue that it is the kiss of death to anyone who says we don’t have enough money for all of the things, all of the support and all of the protections that every child and every young person and every adult needs to be a healthy, happy, vibrant human being. I ask you, you who have traversed the most dangerous terrain, you who have almost, many times, given up in despair, to do this, not because it is easy, but because it is hard. And because of your track record, I know you can do what needs to be done. You can and you will, assure that we stop creating a new generation of mental patients, you can and you will lobby and lobby and lobby our officials to get what every person who experiences mental health challenges needs, wants and deserves; you can and you will work tirelessly to assure that this service is provided in accordance with the values and ethics that are the indisputable rights of every one of us. “The Rehabilitation of the Hospitalized Mentally Ill—The Vermont Story”Eldred, Donald M., George W. Brooks, William N. Deane, and Marjorie B. Taylor. American Journal of Public Health and the Nation’s Health. 1962 January; 52(1): 39–46. “The Depression Workbook: A Guide for Living with Depression and Manic Depression“. Copeland, Mary Ellen. New Harbinger Publications; 1992, rev. 2002.